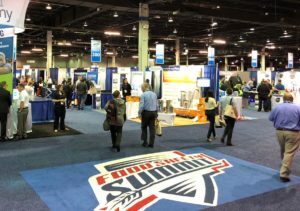 At the Chicago Food Safety Summit there were some notable Food Safety vendors deserving mention because of their apparent superior products. Attending were several hundred food safety vendors, all with a goal of serving the hospitality industry and reducing the incidence of food borne illness. Some products and/or services deserve notable mention. Meritech offered a “Hands on Demonstration” of the “only fully automated handwashing station in the world”. They brag a full wash and rinse in 12 seconds. Eagle Protect had electron microscopy images of vinyl and nitrile gloves. The nooks and crannies of vinyl, as compared to nitrile, make nitrile an obvious superior choice to reduce bacteria contamination. SaniStation demonstrated a patented utensil cleaning and sanitation system that exceeds anything I have seen to date. It is a huge improvement for debris removal, drying and storage. There were so many products it was hard to chose a best of class here. These are some notables. Thermoworks had a temperature monitoring probe/alarm called the “Chef Alert” that seemed a logical, inexpensive best choice for continuous monitoring. The monitor can be used while cooking, hot or cold holding. I bought one for each of our adult children. Wyze Temp demonstrated the only wireless meat probe that can be used for rotisserie monitoring. It can withstand a temperature of 500 degrees. Integrated Control Group displayed the TempMinder designed for wireless monitoring of cold storage and hot holding. Many people are gluten sensitive or have food allergies. Emport LLC offers a series of inexpensive test kits that are quick, easy and reportedly accurate. If you are looking for a contact surface sanitizer, Pure Bioscience offers a product called ‘PURE’ that uses a patented silver compound. It kills virtually every pathogen and is friendly to the hands. SaniProfessional featured the Multi Surface Wipes SoftPack. This no-rinse sanitizing wipe kills many food-borne pathogens. Most importantly, the wipe kills Listeria. Use this wipe especially if your food service works with products that are Listeria prone. Gojo Purell brand hand sanitizer reportedly kills over 99% of pathogens. I have been concerned about its ineffectiveness against Norovirus. Norovirus is one of the most common food pathogens. I understand they are investigating an advanced product. Optimally it may become the best choice for “total germ kills” in consumer hand hygiene. There were so many Food Safety Summit Vendors offering products and services. I chose these to highlight as best within their class. Perhaps you have a product or service you would like me to research and write about in more detail.